If you’re representing for the knitterly parts of North America, you also just put the wrap on a holiday weekend (we had our holiday on Friday, ‘Murricans on Monday), so I hope that means you got in a bit of knitting time with a relaxing beverage. 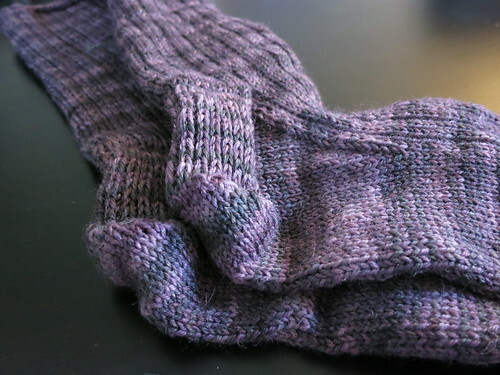 …and then immediately grabbed an already-wound-up skein of sock yarn and cast on for a new pair of Jaywalkers instead. There is a certain beauty in the patterns you’ve already knitted so many times that you can cast them on from memory. These babies are a staple of my sock drawer and have also been gifted from time to time. I love ’em. 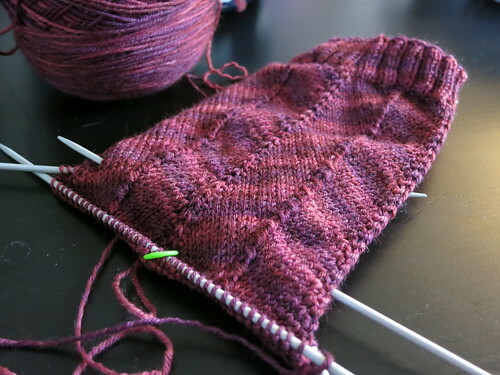 In the end, I could have spent the last few days starting a new sweater or trying a super complicated new-to-me sock pattern, but you know, I’ll take the almost-a-full-leg-of-a-sock and run with it. That’s solid knitting results right there. Sometimes my carry-with-me projects get progress done in bursts rather than consistent and gradual activity, so starting off with a good burst can make a good difference. I hope you’re feeling good about your weekend knitting progress – and if you’re not, I hope that after a rip-out session and a glass of wine, you’re back to fresh possibilities. I am also in sock mode.I am doing your nice ribbed sock. I have just completed my first lace shawl and needed to do some rock solid socks so I can knit while talking, watching TV and fireworks etc.. Those activities were all off limits while doing the shawl. I have the first sock of a toe up pair worked to the cuff area. Do you like toe up or cuff down better? I do love your “A Nice Ribbed Sock” – it’s my standard, works for the skinny ankles in my household. Please, it is Americans. That abbreviation (if it can be called that) is horrid. Cast on and got a good start on a shawl (Follow Your Arrow by Ysolde Teague, finally) only to make an error on the second pattern row on the first chart. ::sigh:: I now have the option of attempting to drop stitches down to fix it, or — more likely — slipping in a lifeline and frogging back about 4 rows. Because of course I did another pattern row and plain row to see if I could live with that mistake. I can’t. Lesson learned. Just finishing up my first pair of socks, baby ones, ever and I definately am getting addicted to sock knitting. There are so many possibilities pattern and colors. I’m already planning my second (bigger) pair.